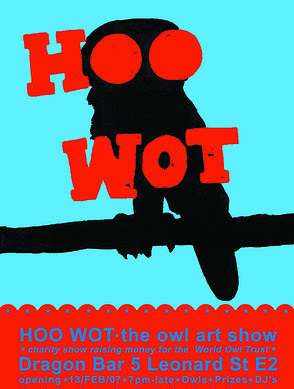 Opening tomorrow night, a show about owls with over 30 international street artists, designers, illustrators, fashion designers, sculptors etc creating their own images of the owl for this group show at the Dragon Bar in East London. DJs, owl prizes, real live owls on site and lots of great art. All profits from sales will go the World Owl Trust to help with their amazing conservation efforts. Some of the artists contributing include; Paul Insect, Kid Acne, Dscreet, Cept,, Matt Sewell, Cat Johnston, Chimp, Pinky,PMH and many more. Quick question, I only just found out about this, so when does this exhibition go on to?